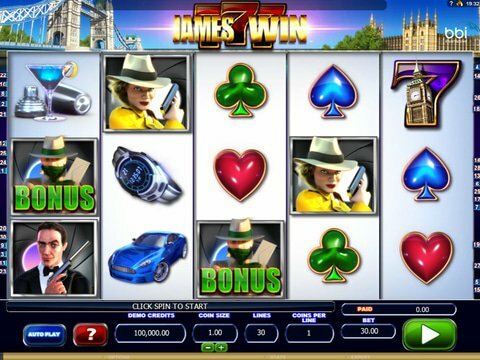 The James Win Slot machine from Microgaming is an action packed, espionage themed slots game based on well-known agent 007, James Bond available on desktop and mobile. If you would like to try this title risk free you can use our free demo slot on this page with no download and no registration required. If you decide to play for free, we recommend All Slots casino where new players can enjoy our exclusive free spins offer as well as a standard welcome bonus of 100% up to $1600. Based on Agent 007 James Bond, this Microgaming slots game is a 5 reel, 30 payline action packed title. It features a Lady Spy icon that creates extra wilds, as well as a London Chase board game that rewards Canadian players with cash prizes. James Win also features a free spins bonus game. Three scatter symbols with a spy glass marked as SPINS will trigger the free spins round where players get 7 free chances to win big. The highest paying icon is the 777 logo and if you get five of these you can win up to 30,000 coins. A golden wild symbols is available and can be used to complete winning combinations. The Lady Spy in a phone booth wild on the 3rd reel gives players 6 extra wild symbols and 2x multipliers. The Lady Spy on her own is a regular symbol. This free play slots game also has a bonus scatter symbol which is a spy symbol with a Bonus label. Three of these on reels 1, 3, and 5 will activate the London Chase Bonus Game. This is played like a board game and players have to spin the wheel in order to advance. The game awards guaranteed cash prizes. Landing on a Mission tile will activate a different game panel containing objects with more mystery cash prizes. If a player reveals the Unlock Prizes message, they will collect all the bonus rewards. If players successfully complete all the mission in this bonus game they will be taken to a secret room where 1 or 2 guaranteed major bonus rewards are won. This is a fast paced, action game from Microgaming that you can try for free with no download and no registration with our demo. For more action based fun why not try The Incredible Hulk from Playtech. This is a 5 reel, 50 payline slot with a progressive jackpot, expanding wilds, free spins, and a pick-em bonus round.